Hotel Lero is a centrally located 4-star hotel with an excellent service. It is a great value for money. This recently renovated hotel is open throughout the year. Due to its central position this hotel is ideal for both business travellers as well as those on holidays. In only 15 minutes on foot you can reach historic Old Town, in 10 minutes Dubrovnik downtown and ferry port and only 5 minutes leisurely walk there is a beautiful small beach. Hotel offers excellent service and staff is very helpful and polite. Hotel Lero offers accommodation in modernly designed staterooms, which has all amenities needed for comfortable stay (tea or coffee machine, phone with direct line, work desk, shower cabin or bath tub, hairdryer, LCD TV, mini bar, safe). Guests can choose from Classic rooms which has all amenities needed for relaxed stay. 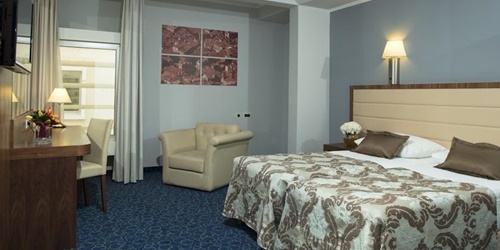 Superior rooms are located in the newly built part of the hotel and are very spacious. Executive rooms are comfortable and each has a balcony with views over the pool or the sea. If you are staying as a family choose Family room consisting of two bedrooms, a bathroom and toilet. Free Wi-Fi is available throughout the hotel and internet corner is available at the lobby. Hotel Lero offers to guests great dining experiences. Main restaurant "Terra" offers a large selection of meals for breakfast and dinner as the whole range of wines. Restaurant "Taj Mahal" is the place where you can taste true Bosnian cuisine and enjoy sevdah music. Piano bar, situated at the very entrance of the hotel, gives you opportunity to refresh with wide selection of beverages. In the evening it turns into a coctail & lounge bar where you can end you day by sipping coctails. Hotel Lero offers a newly built wellness center with an outdoor swimming pool and a whole range of carefully created services. Guests can choose from Jacuzzi, finish sauna and steam bath – all free of charge for the guests of the hotel. Hotel has an outdoor swimming pool equippped with sun loungers for the use of guests. At the hotel guests can book a selection of group or private tours as well as daily trips (Elaphite islands, Peljesac & Korcula, Montenegro, Bosnia & Herzegovina). Hotel can also organize an airport transfer for you. Hotel Lero has multifunctional conference hall with the latest AV technology which can accommodate events for up to 140 participants. If you are flying to Dubrovnik and taking the airport shuttle bus you should get off at Pile Gate. From there take either bus no.4 or bus no.5 to reach the hotel. City bus stop is located only a few steps from the hotel. To reach Old Town take bus no.4 and drive it until the last stop. If you are arriving by car hotel has its own parking space which is a big plus in Dubrovnik.